It used to be that back in the good old days, when Coke was sold in a glass bottle and kids could swill it without adult medical professionals body snarking them, a birthing woman's average labor time was barely four hours. 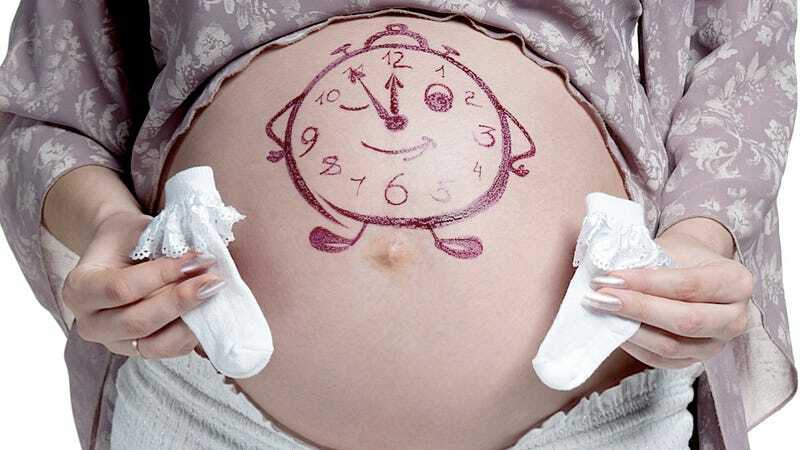 These days, labor is a six and a half-hour marathon, at least according to a new federal study that compared almost 140,000 births from two different time periods. What's the deal with the uptick in recalcitrant infants? Is it that our pervasive entitlement culture has infiltrated the womb, making it seem okay for babies to languish in the coziness of their mothers' amniotic fluid, or are wombs just nicer these days? Though the precise reasons for this increase in labor time aren't quite clear, NPR's Richard Knox notes that one big implication of the new study is that obstetricians haven't kept track of the trend of increased labor time, and may be quicker to perform cesarean sections as a result of using an obsolete yardstick for measuring "normal" labor time. The past definitions of 'normal' labor have been used to draw the line as to when it's time to intervene with a cesarean delivery. But what we've shown is that labor is actually longer ... than it was 50 years ago. That certainly calls for a reassessment of when one should draw the line for cesarean delivery. Even as the increase in C-section births (as of 2007, the procedure accounted for over 31 percent of U.S. births, an historic high) has been scrutinized, Branch and his colleagues at Intermountain Healthcare in Salt Lake City have calculated that the U.S. could save up to $3.5 billion in annual healthcare costs by lowering the national cesarean delivery rate from 32 percent, where it hovers now, to 21 percent. Compared to a vaginal birth's $9,400 price tag, a C-section can cost nearly $17,000 in the Utah hospital system. While the exact causes of longer labor times are unclear, the study suggests a few contributing factors, such as differences in today's mothers from the mothers of yesteryear, namely that first-time mothers today are four years older on average, boast higher body masses, and are a more racially diverse group than their 50s-era predecessors. Babies are also bigger today, with the average newborn being 4-ounces heavier at birth than it would have been in 1960. Lead author of the study Dr. Katherine Laughon also points out the spike in the use of epidural anesthesia during labor, which is known, according to the good doctor, "to prolong labor by approximately 40 to 90 minutes" (though it beats the hell out of experiencing the full, teeth-gnashing brunt of labor pains, so it pretty much evens out the prolonged labor time in the end). Branch also notes that typically today, once a woman goes into labor, she remains in bed until the process is over, which might not have been the case fifty years ago when what we're always told is the "greatest generation" of riveters and rationers got up during labor and "walked around." Additionally, the modern era has seen far more induced labors than ever before, with only one in three women between 2002 and 2008 going into spontaneous labor. Women today, however, are 19 percent more likely to take a drug called oxytocin, which the study is careful to note increases the strength of uterine contractions and should therefore shorten labor times. The solution to longer labors, in other words, isn't a return to natural births, since, the study explains, "if women were allowed to progress in natural labor without oxytocin, the stages of labor could be even longer with the same odds of achieving vaginal delivery." Branch and Laughon acknowledge that they don't know enough details about differences between births today and those in the 50s or 60s, but insist that the naked, wailing fact that labor times are longer has crowned and shouldn't be ignored.